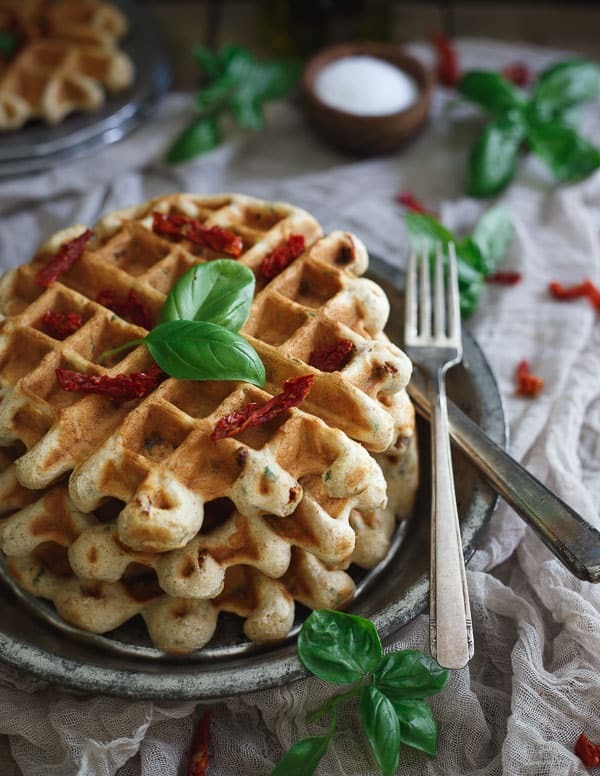 These hummus waffles are filled with sweet Italian sausage, sun-dried tomatoes and basil. Dip them in hummus for a savory bite or serve with a fried egg on top as a meal! I have never understood the spider fear which seems to plague 99.9% of women. It’s basically a bug that’s like 1/100th the size of us with a few extra legs which for the most part, doesn’t even do anything to us and yet those with two X chromosomes seem to freak.the.eff.out. in its presence. I just don’t get it. In this house, I’m the spider killer. Ulysses can be lumped in with the girls for this one because he’s basically just as bad. The other day there was a HUGE one in our garage, I saw it as I was putting my shoes on, ran inside to get him because it was pretty impressive and he refused to even come and look at it out of fear. Want to know what does freak me out a bit though? Particularly ones that surprisingly slither around the pot of basil you’re about 2 inches from cutting off leaves to use in savory hummus waffles. Also known as ones that make you jump so high the scissors in your hand go flying off the deck and your scream freaks the dog out so much she falls down the stairs she was precariously perched on basking in the sun. So yeah, that happened. Eight legs don’t freak me out, but zero legs and the ability to slither…shivers. Snakes and spiders aside though, I got to visit the Sabra hummus factory in Richmond, Virginia a couple weeks ago. To say it was a blast would be an understatement. From a dinner that had menu items marked with paleo options to start (clutch while in the middle of a paleo challenge) to an entire day filled with every single hummus flavor they make to white water rafting before the flight home, I kind of never wanted to leave. The day at the factory included taste testing all the hummus, getting to create our own new hummus flavor with almost every topping, spice and oil you can imagine at our disposal and a factory tour. I went the pickled route putting everything pickled and preserved there was on top of the classic hummus with some lemon oil to finish. It didn’t win the contest but I’d eat it all day everyday. We learned about the fun pop-up restaurant Sabra opened a few months back in D.C. all about hummus and even got to watch chef Pete Taylor make one of the most popular items on the menu called “East Meets West”. All three flavors were out of this world. If I had to pick a favorite though, the preserved lemon one won me over. The highlight of the day though was tasting the two new flavors coming out: Rosemary with Sea Salt and Caramelized Onion. I was SO psyched to try the rosemary one but actually ended up liking the caramelized onion one even more. Be on the lookout for both of these new flavors in the upcoming weeks! Want to know why people don’t want to eat hummus? 52% of non-users think it will taste bad. I wonder if those same 52% don’t like chickpeas or if it’s just the ignorance of not realizing hummus is made from chickpeas? 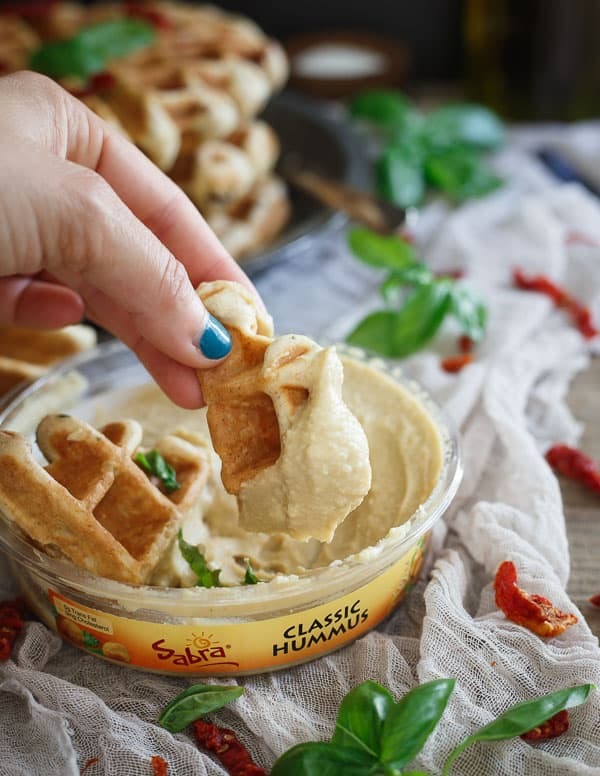 Besides dipping any and every vegetable you can think of, crackers and pita chips in it, spreading it on toast and using it in place of mayo for salads, you can make these savory hummus waffles. 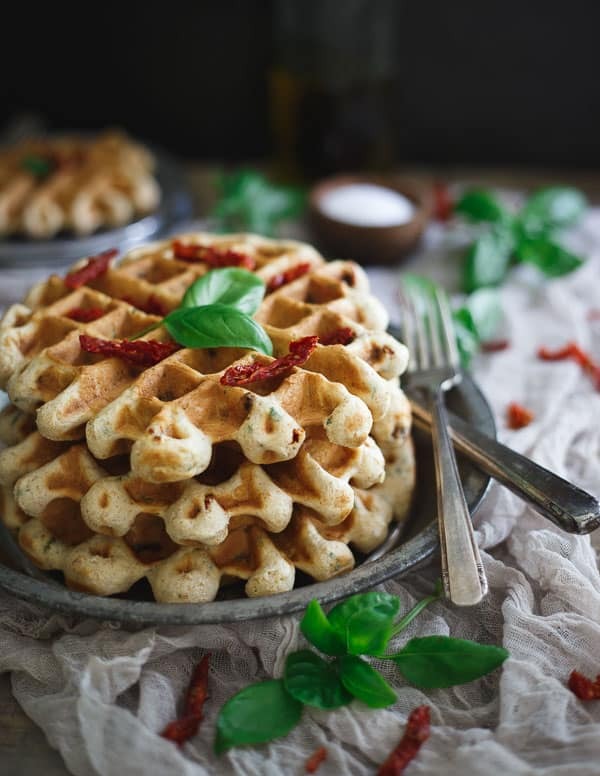 Sweet Italian sausage gets browned up, tossed with sun-dried tomatoes and basil in a basic waffle recipe with hummus in the batter in place of most of the oil for a creamy, healthier spin on a savory waffle. Categorizing these as one meal is pretty hard, they’d be perfect with a fried egg for breakfast, great broken up into appetizer size portions and dipped in even more hummus or a great dinner option when you want to go the savory brinner route. Take your pick, but don’t even try to use the ‘no occasion to eat it” bs again. Combine waffle mix, egg whites, milk, hummus and olive oil in a large bowl and stir until combined and smooth. Add the cooked sausage, sun-dried tomatoes and basil and stir until incorporated into the batter. Season with salt and pepper to taste. Batter will be pretty thick. Grease the waffle iron with baking spray then spoon the batter onto the waffle iron. Cook according to your waffle iron's settings. Serve with additional hummus for dipping or spreading or, top with a fried egg. I could eat hummus every day of the week! Love this savory twist on waffles!! I am ALL about the savory waffles lately ;) These look awesome – and dipping them in hummus, MMM! This is such a fun idea! I want one (or 3)! This is new to me, Gina, but I love it. My family would, too. Love the savoriness with the hummus! Savory waffles are the best and how I love that you pumped these up with hummus! 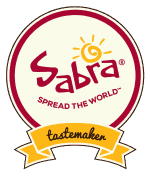 When I visited Sabra, I was also really surprised at how many people are reluctant to try hummus. Hopefully awesome recipes like this one will change their minds! In this moment, to forever be documented on the internet, I love you. Cuz, damn these waffles look awesome. How very cool and innovative! I haven’t jumped on the savory waffle trend yet..but now I just might! I’m so with you on snakes – no thank you! But I’m also with Ulys when it comes to spiders. The little ones I can handle but anything that’s super fast or those creepy jumping ones – no way. These waffles though – so all about these! 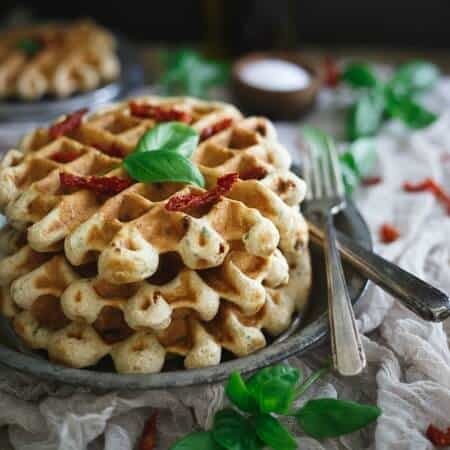 These savory waffles look incredible! So much yumminess in every bite. Yeah, I’d be much more freaked out about a snake than a spider! I really don’t understand people who don’t love hummus. It’s a separate food group in my house! So fun you got to go to Richmond- that’s my hometown but I didn’t know Sabra was there. 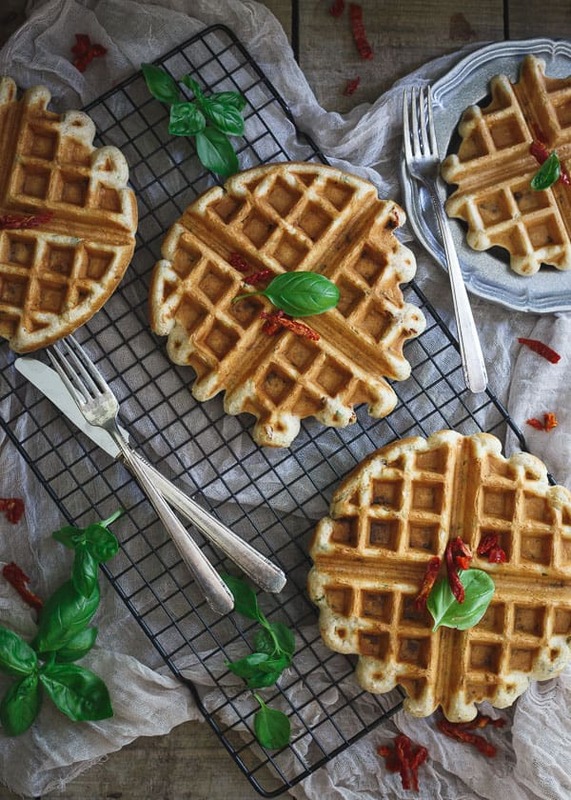 Love the idea of these savory waffles! Such an interesting concept- looks awesome. I’ve never made savoury waffles before! But they sure look delicious and I definitely need to try the recipe. I love the way that you pumped these up with hummus. Its really very cool and innovative. Love the idea of these savory waffles. I’ve never made savory waffles before. First time I tried it but failed. Next week I again try and succeed. Thank you for sharing your recipe. Wow, I never thought to put hummus in waffle batter. Genius!! I’ve been meaning to try adding hummus/tahini to unconventional things. Love these savorywaffles! These waffles look absolutely delicious…with so many tasty possibilities. Adding hummus to waffles is such a genius idea.